Way back in June when we were still a family of three and Piglet was still two, she made a statement when we passed by her preschool buses one morning that she could ride them when she was three. I thought she was a wee bit crazy and optimistic. But LO and BEHOLD and BY GOLLY, she was right! She started transitioning to the three year-old class the week before her birthday (yes, that was almost a month ago, I am slack and behind in blogging). She was spending part of the day in her old class and part of the day in her new class. 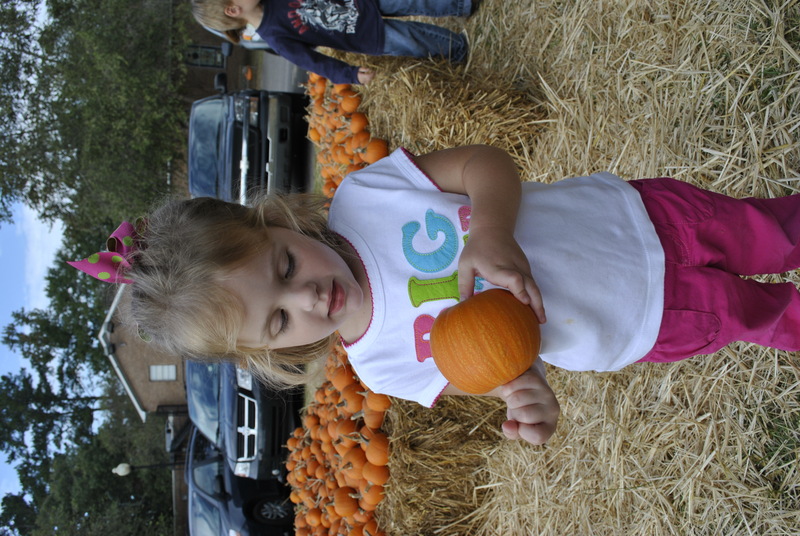 I saw on her new class schedule that they would be going to the pumpkin patch the next day. I checked with the director to see if she would be going on the field trip with her new class or staying behind with her old class. They deemed that she was field trip ready, but then said, “Oh wait, she’s not three yet, she can’t ride the bus”. She turned three the day after the scheduled field trip, but rules are rules. They said that I could drive her to the pumpkin patch. I decided that it would be fun to see her in action with her new school friends, and I could get to work a little late that day. I thought we would just go play amidst the pumpkins for a while, pick out a super cute one to call our own, then head back to school. I was very wrong. This pumpkin patch was at a church that truly saw this as a ministry to the kids. We started out getting stickers, which Piglet thought was AWE.SOME. What is it about kids and stickers? We can get Piglet to do just about anything with the promise of a sticker, especially if said sticker has a princess on it. Then we went to hear some stories about pumpkins. These stories were also about Jesus. Jesus + Pumpkins = good cheesy story time. Something about how Jesus scoops all of the yucky sin out of us and puts a smile on our faces and a light inside of us. I’m pretty sure the message was completely lost on the class of three year-olds who were way too distracted by all of the pumpkins in their line of sight. After story time, we go to go on a hayride. But they couldn’t find a tractor or a trailer, so it was a hayride in the back of a truck around the parking lot. But the kids still thought that was pretty cool. Then, it was game time. We tossed hula hoops over pumpkins. The kids were not so good at this and we had to stop shortly after beginning because kids were getting whacked with hula hoops. 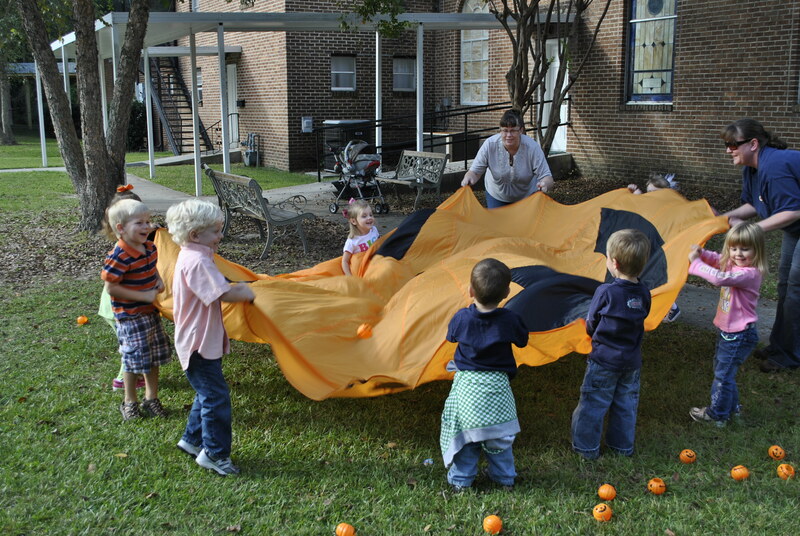 BUT THEN, they had a PUMPKIN SHAPED PARACHUTE. It was Halloween fun perfection for the three year-old set. Then we headed over to the craft station, then to the plant a pumpkin seed station, then to the potty, then to snack. Snack was groovy with orange flavored/colored juice, pumpkin pudding and candy corn – these folks know how to make a theme carry through to the end for sure. Then we loaded back in the car and headed back to school – three hours later. So much for a productive day at work. Oh well, the field trip was worth it! I think I’m going to like being a field trip mom! (But I will NOT, under any circumstances, wear a fanny pack). I’ll save that for when dad goes on the field trip. Maybe one of these days I’ll get to be a field trip dad. Cool idea for a church to do.